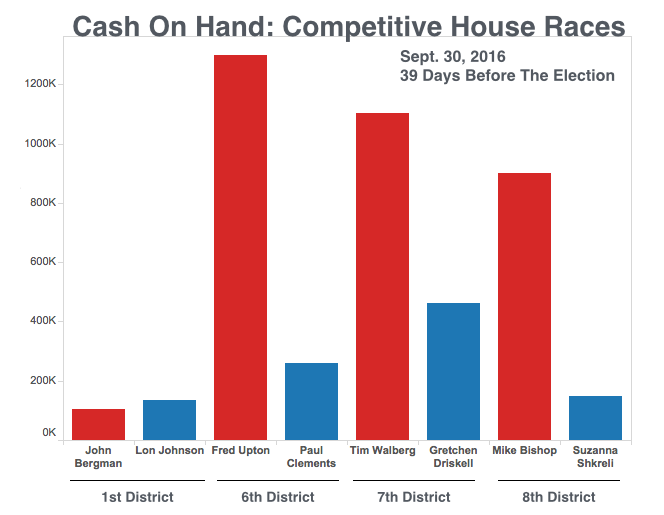 Which U.S. House Races Are Drawing The Most Money And Where Is The Money Coming From? LANSING — A race for the U.S. House in Northern Michigan and another in Southern Michigan are shaping up to be the state’s most expensive congressional battles of the 2016 cycle. In the Northern Michigan 1st District, where Democrat Lon Johnson, of Kalkaska, is running against Republican John "Jack" Bergman, of Watersmeet, groups have already reported $2.1 million in independent spending. 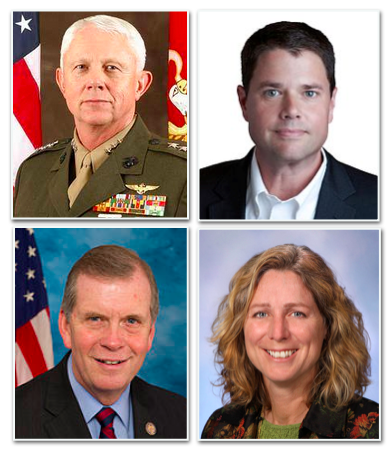 In the 7th District, the two candidates, U.S. Rep. Tim Walberg (R-Tipton) and State Rep. Gretchen Driskell (D-Saline), combined to raise over $1 million in the last quarter alone. Candidates’ latest campaign finance disclosures were due on Saturday for the quarter from July 1 through Sept. 30, 39 days before the election. The active major party candidates running in Michigan’s 14 congressional districts have reported raising a total of $26.1 million as of Sept. 30 for the cycle. At the same point in the 2014 cycle, the active candidates were at $26.4 million. 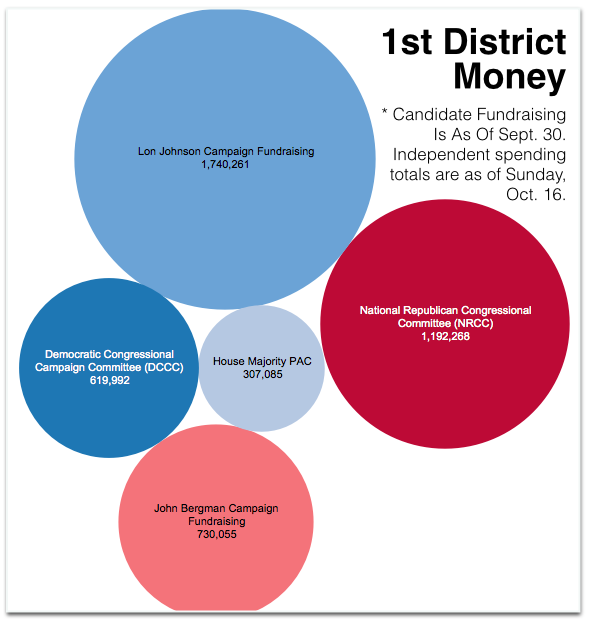 The candidate who’s drawn most money is Republican businessman Paul Mitchell, of Washington, in the open 10th District. Mitchell’s campaign has taken in a total of $3.815 million with $3.561 million coming in loans or contributions from Mitchell himself. Mitchell won a competitive GOP primary in August. Below is a look at the general election races drawing the most cash and where it’s coming from. National groups are pouring money into Northern Michigan’s 1st House District to try to claim the open swing seat. As of Sunday, the National Republican Congressional Committee had reported $1.192 million in independent spending to help Bergman, a retired lieutenant general who’s the Republican candidate. The Democratic Congressional Campaign Committee had reported $619,991 in independent spending to boost Johnson while the House Majority PAC, tied to House Minority Leader Nancy Pelosi (D-Calif.), had reported $307,085 in spending to help Johnson. Johnson, the former chair of the Michigan Democratic Party, reported raising $455,117 during the last reporting period. For the entire cycle, Johnson has raised $1.740 million. In the last quarter, Johnson’s top donors included the League of Conservation Voters Action Fund ($5,000), the Utility Workers Union of America ($5,000) and the Carpenters Legislative Improvement Committee ($5,000). Bergman continues to trail Johnson in fundraising. Bergman’s campaign reported raising $383,924 last quarter. His campaign has raised $730,055 for the cycle. Bergman loaned his own campaign $83,000 in the last quarter. He’s now loaned his own campaign $353,120 total. Bergman’s top donors for the last period included Bryan Ball of Mallinckrodt Pharmaceuticals ($5,400), Walt and Judy Havenstein, of New Hampshire, ($5,400) and Francis Rooney of Rooney Holdings $5,400. Johnson’s campaign had $134,965 cash on hand as of Sept. 30. Bergman’s campaign had $104,580. At the end of the most recent reporting period, Walberg and Driskell surpassed more than $2 million in fundraising each for their campaigns this cycle. Driskell’s campaign raised $564,528 in the last quarter to push her total for the cycle to $2.093 million. Driskell’s campaign has been running broadcast TV ads since the end of August. The campaign reported spending $881,410 on “TV” in the last reporting period. Driskell’s campaign reported 19 donors who gave $5,000 each in the period, including the Service Employees International Union and the American Federation of Teachers. Walberg’s campaign raised $512,413 in the last quarter while spending $585,191 on “media buys” and $16,503 on mail. The campaign has now raised $2.162 million for the cycle. In the quarter, Walberg received $250,899 from political committees. His top donors included Pamella DeVos ($5,400), David Grohne, of Wilmington, Ill., ($5,400) and Charles Johnson, partial owner of the San Francisco Giants ($5,400). As of Sept. 30, Walberg’s campaign reported $1.101 million cash on hand. Driskell’s campaign reported $462,633 cash on hand. For the entirety of the 2014 race in the 7th between Walberg and Democrat Pam Byrnes, the two campaigns combined to raise just $3.2 million. 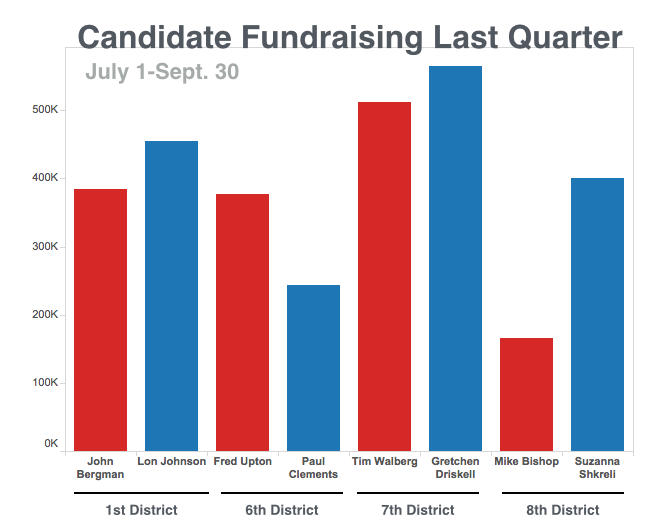 Unlike the other districts where Democrats had a fundraising advantage last quarter, U.S. Rep. Fred Upton (R-St. Joseph) continues to draw big money in the 6th District. Upton’s campaign raised $377,042 in the quarter while his opponent, professor Paul Clements, of Kalamazoo, raised $244,087. For the cycle, Upton has raised $2.805 million. Clements, who lost to Upton in 2014, has raised $884,850. A Super PAC called ClearPath Action has spent $22,000 in the race to support to Upton. Upton raised $249,450 in the last quarter from other political committees. Twenty-two different PACs gave Upton $5,000 each, including the Home Depot PAC, the American Lighting Association PAC and the Halliburton Company PAC. Clements’ top donors included Florida investment adviser Donald Sussamn ($2,700), Vincent Ryan, of Massachusetts ($2,700) and Timothy Caldwell, of Mt. Pleasant ($2,700). Both Clements and Upton have been running broadcast TV ads. Clements’ campaign reported spending $290,968 on TV advertising between July 1 and Sept. 30. Upton’s campaign reported spending $222,702 on media buys over that time. As of Sept. 30, Clements’ campaign had $259,801 cash remaining. Upton’s campaign had $1.297 million. In the 2014 version of the race, a Super PAC called Mayday PAC spent $2.1 million to boost Clements. Suzanna Shkreli, the Democratic challenger in the 8th District, reported raising $411,421 in the last quarter. The incumbent in the 8th, Rep. Mike Bishop (R-Rochester), reported raising only $165,694. Shkreli started airing broadcast TV ads before Bishop, but now both campaigns are airing ads. Still, Bishop, who’s running for a second term, has a major cash advantage. He’s raised $2.100 million for the cycle while Shkreli, who’s campaign didn’t launch until July, has raised only $411,421. Bishop reported $899,529 cash on hand as of Sept. 30. Shkreli’s campaign reported only $150,071 cash on hand. Bishop’s top donors for the quarter included the Edward Levy of Edward Levy Co. ($5,400), the Realtors PAC ($5,000) and the Asplundh Tree Expert Co PAC ($5,000). Shkreli’s top donors for the quarter included the Democratic Congressional Campaign Committee ($5,000), the Michigan Democratic State Central Committee ($5,000) and Emily’s List ($5,000). * Candidate photo collage photos come from the candidates' official campaign websites or are their official government photos.